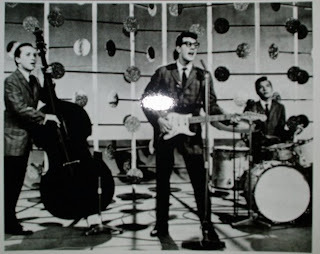 Yesterday marked the 50th anniversary of Buddy Holly's death in a plane crash. It is, as Don McLean immortalized in his hit "American Pie", "the day the music died." I've very recently gotten into Holly's music, and what always astounds me is the number of hits this kid had. Remember, he was only 22 when he died, and yet the list never stops: "Maybe Baby", "That'll Be The Day", "Oh Boy", "Everyday", and "Peggy Sue" just to name a few. John Lennon and Paul McCartney were huge Holly fans, and McCartney later brought the rights to Holly's music. Sadly, I very rarely hear Holly's music on the radio anymore, and I bet few people who are the age he was when he perished have ever heard of him. We need to make sure people don't forget important, talented entertainers who contributed so much to music history. That's why I'm mentioning that MSNBC published a very well-written tribute to Holly on yesterday's site. Click here to read it. I visited the Holly (Valens/Big Bopper)crash site nine days ago. Its out in a corn field. There are many memorials placed ther from fans. See 42N posts from July 21 and 24th. Holly was a pure music genus.